Jerod Mayo is an American football linebacker for the New England Patriots of the National Football League. He was drafted by the Patriots tenth overall in the 2008 NFL Draft. He played college football at Tennessee. Jerod Mayo was drafted by the New England Patriots in the first round (10th overall) of the 2008 NFL Draft ... Signed by the Patriots (7/24/08). * Mayo became the second Patriots player to win the Associated Press Defensive Rookie of the Year Award, joining Mike Haynes (1976). * Mayo has led the Patriots in total tackles in each of his first two seasons with 139 tackles in 2008 and 114 in 2009, despite missing three games due to injury. * Mayo's 2008 tackle total led all NFL rookies. * In a game against the New York Jets on Nov. 13, 2008, Mayo finished with a career-high 23 tackles (17 solo). * In the month of December 2008, Mayo led the Patriots with 35 tackles as the team went 4-0 in the month while allowing just 13.5 points per game, including a season-ending shutout at Buffalo. * Named a defensive captain by his teammates in only his second season in the NFL. * Was credited with nine tackles against the Steelers (11/14). * Made nine tackles against the Browns (11/7), putting him on pace for over 200 tackles in 2010. * Extended his streak to four consecutive games with 10-plus tackles, finishing with 17 tackles against the Vikings (10/31). He stopped Adrian Peterson for no gain on third-and-one in the first quarter, forcing a Vikings punt. * Recovered a Chargers fumble forced by Dane Fletcher at the San Diego 22-yard line in the first quarter, helping to set up a one-yard touchdown pass from Tom Brady to TE Rob Gronkowski for a 7-0 lead (10/24). * Recorded 10-plus tackles for the third game in a row, becoming the first Patriot to do so since Tedy Bruschi did in 2006. He finished the game against the Chargers with 12 tackles and is on pace for a career-high 205 tackles this season (10/24). * Led the team with 19 tackles against the Ravens, his second highest career total (10/17). * Led the team with 17 tackles (16 solo) against the Dolphins (10/4). * Picked up his first sack of the year, dropping Ryan Fitzpatrick for a seven-yard loss on second-and-seven from the Patriots' 15-yard line, helping hold Buffalo to a field goal two plays later. Also led the team with nine tackles against Buffalo (9/26). * Recorded nine tackles against the Jets (9/19). * Started at inside linebacker in the season opener against the Bengals, registering 11 tackles (9/12). * Played in 13 games with 12 starts and led the team in tackles with 114, despite missing three games due to an injury. * Added 1.5 sacks and one forced fumble. * Registered double-digit tackles three times: (16, MIA, 11/8; 11, at MIA, 12/6; and 16, JAX, 12/27). * Registered his first career sack at Indianapolis (11/15) when he sacked Peyton Manning for an 11-yard loss in the second quarter. * Went over 100 tackles for the season with a 16-tackle performance in the Patriots' 35-7 AFC East-clinching victory vs. Jacksonville (12/27). * Was forced to leave the season-opener vs. Buffalo (9/14) in the first quarter due to an injury and missed the next three games. * Returned to action at Denver (10/11) but did not start. H Recorded his second career forced fumble, stripping Knowshon Moreno of the ball on a reception from Kyle Orton in the first quarter. * Teamed with Tully Banta-Cain on a half sack at Miami (12/6). * Started in the postseason game vs. Baltimore (1/10) and finished with seven total tackles. * Started every game at inside linebacker and became just the second Patriots player to be named Associated Press NFL Defensive Rookie of the Year, joining Mike Haynes (1976). * NFL defensive rookie of the year by ESPN.com, SI.com and Pro Football Weekly. * Led all NFL rookies in tackles in 2008 and led the Patriots in tackles with 139 stops, according to coaches' film breakdown, a 54-tackle lead over the next leading tackler. * Named Rookie of the Month for the month of October. * Tallied 23 tackles (17 solo) vs. the N.Y. Jets (11/13), the highest total by a Patriots player since 1994. * In the month of December, led the Patriots with 35 tackles as the team went 4-0 in the month while allowing just 13.5 points per game, including a season-ending shutout at Buffalo (12/28). * Scooped up his first NFL fumble recovery, snatching an Andre Hall fumble forced by Ty Warren vs. Denver (10/20). * Started at inside linebacker and led the team with 10 tackles while also posting his first career pass defensed at Indianapolis (11/2). * Credited with a forced fumble with his hit on Tim Hightower after just a 3-yard gain on a swing pass vs. Arizona (12/21). * Started 26 of 32 games at Tennessee, playing for three seasons from 2005-07 after redshirting in 2004, and recorded 236 tackles (137 solos) with six quarterback pressures, 6.5 sacks for minus 51 yards and 21 stops for losses of 82 yards. * His 140 tackles in 2007 were the most by a Tennessee player since 1990. * His 19 tackles versus Kentucky in 2007 were the most by a Tennessee player since 1988. * Moved to middle linebacker in 2007, starting all 14 games, and recorded a career-high 140 tackles (79 solos) and returned an interception 34 yards for a touchdown. * Jerod Mayo was born February 23, 1986. * Attended Kecoughtan High in Hampton, Va., where he was a Prep Star All-American and 2003 Defensive Player of the Year in the Virginia Peninsula area. * Added all-state and first-team all-district honors as a senior, recording 110 tackles, including 18 for loss, and two interceptions. Also played running back for seven games, picking up 1,245 rushing yards and scoring 13 touchdowns during his final campaign. * Has two brothers, Deron and Derek, who play college football. * Majored in sport management at Tennessee. * Jerod has two brothers who play college football. His brother Deron Mayo is a junior at Old Dominion, and his brother Derek Mayo is a senior at Richmond. Jerod, Deron and Derek Mayo are all linebackers. Derek's Richmond team won the NCAA Championship Subdivision title in 2008. * Jerod has been involved with United Way, filming a PSA for the New Hamshire 2-1-1 help line. 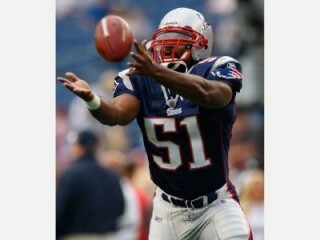 View the full website biography of Jerod Mayo.